I don't play much Vintage anymore, but all I know is, this guy is in-sane in Modern and Legacy. I think he's *better* than Vendilion Clique in a vacuum, and in the Eldrazi decks with the all of the cost-reducing lands he's borderline broken. I'll be playing the hell out of this card in Modern and Legacy until something gets banned. I wouldn't be surprised if you could play Eldrazi.dec in Vintage as well. MTG Fan, I suggest buying in some Nether Voids and Chains of Mephistopheles if you don't have them already. They go in the Vintage and Legacy versions of the Eldrazi deck. Debating which existing card is "most like" a new card is a great way to evaluate them. How did that work for Jace, Vryn's Prodigy? The biggest question in my head is whether he is better or worse than Merfolk Looter. When you initially cast him, that's exactly what he is, though he does lack the ability to swing for 1 in a pinch. Then, if you loot when you're mostly at threshold, he flips -- you have no choice about this. Is that a good thing? Baby Jace got created when Snapcaster and Merfolk Looter had a night of passion and romance, and I don't know that I like their child better than both parents. He's really hard to get a good judgment on. So... I'm still highly skeptical. The threat of being able to regrow something AGAIN if Jace is left uncontested makes me leery, though, because recurring something every three turns actually is pretty strong. At least strong enough to make an opponent look for an answer. At the end of the day, Lil Jace politely asks the opponent if they have an answer, whereas something like Dack demands it and Big Jace holds a gun to their head. It turns out that, yes, having a 2 mana growing threat like Jace IS pretty strong. You set and forget the lil' bugger. The threat is strong enough to make it very playable. I suppose it's similar to what made Seal of Primordium and it's ilk preferable to Disenchant back in the day; invest mana on a non-critical turn to put long-term pressure on the opponent. I underestimated the raw strength, but the comparators were leading to the correct analysis. Seriously, I could not disagree more with your statement. Read the card text and look for applications of the new card. Try to consider what decks would run it, what situations it would be good in, what situations it would be bad in. The decks interested in Though-Knot Seer would likely not play Vendilion Clique or Sin Collector so why bother comparing the two? Because it's what we have to work with, and because for all the hype, Thought-Knot Seer is not as much of an unknown quantity as quirky cards like Jace are. We can easily get a handle on what he does. Assuming generating the <> is trivial, he's a Sui-Chi that disrupts the opponents' hand when he enters and MIGHT allow the opponent to draw a card down the road. It's another example of adding a spell-like effect to a reasonable body, just like Lodestone Golem. When it comes to the role that Sui-Chi 2.0 plays, I think we know what that is. It's not an early game disruptor like duress; its just a way to ensure you're still disrupting when you play your big beatstick. Unlike Lil Jace, his casting cost is not insignificant. I'm not saying the card is bad at all. I just look around and do not see many 4+ mana beaters in the format except in shops (in which this guy is awkward) and the occasional flying blue finisher. We did have Sin Collector, which saw some play, has a very similar ability and at very similar casting cost. (EDIT: Perhaps "similar point on the curve" is a better way to say it.) So, I look at that. I think that's totally reasonable. No, they weren't....You said you are still skeptical about the card which is evidence that you don't understand it and it's role in the format. What you don't seem to get is that the question was not whether it was better or worse than Snapcaster Mage/Merfolk Looter/Dark Confidant/Jace, the Mindsculptor/etc. The question was whether or not Jace, Vryn's Prodigy was a playable card in a Vintage deck. And all you need to answer this question is the text on the card - you don't need to make comparisons to other cards that are not functionally identical (i.e. Anticipate to Impulse). As a matter of fact, it's harmful as you get pigeonholed into these mindless comparisons and lose the mental flexibility to properly evaluate the cards in the right deck. But none of the decks that will run Thought-Knot Seer would ever run Sin Collector or Vendilion Clique (or Sui-Chi), so how are these comparisons valuable? And please don't say "it shows selective discard is a desirable affect", because That is so easy to discover that it suggests conspicuousness or little need for perspicacity in the observer. I guess I don't understand your criticism. Until the playtest data rolls in, what can we do except look at similar cards and examine how the new ones compare? In general I agree without testing this is as far as we can go. However you have missed his point is that comparison is an extremely shallow analysis method. And when using it you have to understand the differences of the cards. Not just compare the similarities. This is not Sin Collector, nor is it Su Chi. If you want to call it Sin Collector merged with Su Chi that would be a more apt comparison. In which I'd say two formerly playable cards merged together (taking the best characteristics of both) is pretty darn good. "Hello, I'm still seeing play." It has WU in the cost and hexproof at times, so it's like geist of saint traft...lets you do a Jace, Architect of Thought -2 when he attacks, so it's like that Jace, and is a 5/4 flier like Venerable Lammasu. 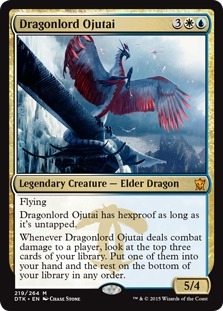 Geist, Jace, AoT, and Venerable Lammasu are all not played in Vintage, therefore Dragonlord Ojutai is unplayable in Vintage. This analysis proves that Dragonlord cannot be used in the format - stop playing him immediately. Well, this was a weird statement. Faithless looting, steal artifact are not played => dack fayden cannot be played. That is similar to "jace is an expensive brainstorm". @Chubbyrain: When do you want Seer? I'd want it in mud, as a T3 "lock" piece. Open with sphere/golem, follow with tangle, close with seer. By that time you should have the opponent behind in mana, and you can take the answer/bomb before they can play it, while having a 4/4 in play. If the opponent has mana/resources to take it, still has to face spheres and other creatures. I REALLY see it as the duress that takes your comeback while you are waiting tangle to lose counters. Is the 4/4 that makes your mentor or delver hopeless. Is the menace that makes hurkyl's an innefficient answer. And I think it can be used in other mana hating decks, not just mud (I agree that 4cc is quite high, but reward is important). Opponent does not want to jace it to your hand. Bolt is not enough to kill it. Against which decks do you want it? Not dredge, not mud. But think about control: they are often playing few win conditions and you can exile one of them. Against storm, provide you are still in the game, you can know their hand, take the bomb, and get down the life to prevent necropotence. Against oath, take the namesake or S&T. Even against aggro decks is a decent 4/4 that takes the removal or the big creature, pretty decent. I think is a good tool. Mr. Dragon is being sarcastic but echoing my thoughts on how ridiculous comparisons can be. With Shops, I think it's greatest value is in being a 4/4 that dodges Artifact removal and can't be Dacked (and has the perfect power to kill Dack with a loot). The ability is a bonus on top of that, but what concerns me is that it might be difficult to cast and doesn't synergize with the most popular lists now. I think that this card might spawn completely new decks, which is very cool in my opinion. I'd want it in mud, as a T3 "lock" piece. Open with sphere/golem, follow with tangle, close with seer. A 4/4 + duress is no small thing, but let's be serious. You can't play this card off a Workshop, and Tangle Wire taps down your mana, too. To make the play you're talking about, you'd require a hand of "[Workshop/Tomb], Sphere, [Any Land], Tangle Wire, [Any Land], Black Lotus, Mana Vault, Thought-Knot Seer" ... This is not going to happen most games. If Thought-Knot is going to be good, it's not going to be in a list that expects to make those series of plays consistantly - because it's just not going to happen. We need a more realistic average opening sequence for the card to be playable. I know you're trying to force your point through humor, but it feels like it's coming at my expense. Anyway, this analysis misses the whole point of comparing it to prior cards. You don't just ask how many other unplayable cards you mash together to get this new one. You look at what playable cards fill a similar mechanical niche. It's certainly true that a new card can carve out a new niche. If you printed Mishra's Workshop for Beasts, for example, I bet you'd suddenly have a new niche to fill. But, it's a rare card that can cause that kind of sea change. More often then not a card works when it satisfies particular mechanical niches that a deck wants to operate. That's why I referred to Lodestone Golem as well as to Sin Collector and Sui Chi. They're technically stomping around some of the same niches this guy fits into. (Except all-in Eldrazi, more on that in a moment. *) There's absolutely nothing wrong with that. Does Vintage want a 4-mana curve topper that functions as the largest non-Oath creature on the battlefield while continuing to pressure the opponent's hands on turns 3+? That's the question I think you ask about this card, and looking at similar cards helps. I've never said this guy is BAD, just that he's 4 mana for a 4/4 and an effect we usually associate with being important on turn 1. * = I suspect much of your feeling about whether you like or love Seer is based on whether you think we actually have a Mishra's Workshop for Eldrazi now in the two Eldrazi Sol-lands. If you think we do, then sure, you look at Lodestone and conclude that a 4/4 for 4 + thoughtseize looks great. If not, the picture is muddier. That is, do we have a critical mass of Eldrazi creatures to make this potentially Vintage-level acceleration playable. On this point, I think the answer is probably, "not successfully." Seer helps, but you're still very limited and incredibly vulnerable to shops if you were to try and run an Eldrazi all-in type deck. Proof is in the pudding, Cosby. And she's been making lots of pudding, mostly at your instance, BPK. P.S. You still would have beat my RandomBlack.dec with an Air Elemental in place of Ojutai. Not meant at anyone's expense. I just love sarcasm. I have no dog in this fight - Seer is okay, maybe sees play, maybe won't, but I won't use him in any of my decks. I was echoing Chubby because I saw an opportunity to be funny. I don't agree wholly with him, nor disagree wholly with you. Seeing how a card compares to others is fine...if it is virtually identical (preordain/ponder/serum visions). When something is a mashup of several effects (JTMS) or is something entirely new, it's probably best to just read the text and see where it fits, or how it can be built around/abused. I just try to make someone laugh (if only myself) most times, and occasionally slip in some enlightening tidbit or decklist here or there. So, yeah...nothing personal. I'm really curious if this could be a legitimate deck in Vintage. It would really be nice to have something completely new come around. I'd be hesitant to maindeck more than 1 Chains simply because of how horrible that card is when facing a Dack, which is fairly omnipresent these days. I also wonder if a Dark Depths plan might be worth considering somewhere in that list. Other than that, the deck looks pretty interesting and a Turn 1/2 Seer is pretty big game. Dark depths is certainly a good route. So could playing eye of ugin and 4 eldrazi mimic. You get to play unlimited numbers of them on turn 1, following up with a turn 2 thought knot seer. Take your best card, swing for 16 in the dream turn 2. Dack fayden and chains does read mind twist me. But chains is still very powerful. Well, in my head is not that complicated. I'm not assuming lotus/mana vault since they are restricted cards. Tangle is also not the worst own enemy, but golem and sphere of resistance. This assumes 4 mana sources by turn 4, and 3 lock pieces. Tap the 3 lock pieces for T4 tangle, and pay with the 4 manasources for seer. If one of the manasources is MWS, you need a lotus/sol ring/crypt/vault/tomb/city of traitors if you only have 3 other mana sources. Any golem/sphere increments the cost. Still seems pretty castable past T4, even when drawing strip effects. Golem is the all star of the deck, seer is not that great. You want 4 golems, and would play 12 if possible. You don't want seer in your opener, but as a mid-early draw to close the game. It's not the duress effect; it's not the 4/4. Is the combination, specially since it dodges artifact hate. Also it's a pretty good target for metamorph. Sooo..... Pro Tour Eldrazi Face Smash is in the books and I suspect will have repercussions for several formats moving forward. I think overall, looking back at this thread, the card it most underestimates is Eye of Ugin. Naturally, on seeing the arrival of colourless cards en masse, most Vintage pilots wondered how to squeeze them into Workshop decks here and there - but after watching this weekend's action, I'm not even sure Mishra has a part to play in any Vintage Eldrazi deck. The shennanigans possible with Eye + Sol lands seem very powerful - and perhaps powerful enough for this format two. I mean, it was not rare to see three threats dropped off on Eye on turn 1 (eg in the Top 8, 2 Mimics, plus a 2/2 Endless One), followed by Temple, Thought Knot Seer, swing for 10 on Turn 2. While Vintage obviously has access to Force of Will, efficient removal and wasteland, this still seems like a pretty powerful play - and that's before you consider the possibility of a Caverns-fuelled version as per the UR build that took home the trophy. Did anyone else watch the PT? What did you guys make of Eldrazi tribal and its plausibility in Vintage? Certainly, I think it shows promise at least and that it might be worth reconsidering how playable Thought-Knot Seer and its foul, tentacled brethren are in wake of the weekend's fairly amazing results. I finally got the cards to play some version of the Eldrazi deck on MTGO; just need to find the time to play! There are some challenges to overcome, but I'm curious to see if there is some configuration that can deal with the fast decks of the format, particularly combo. Eldrazi can't play FoW, so it's going to rely heavily on disruption to get the upper hand. TKS helps, but it's very rarely coming down on Turn 1 so I have to imagine the main decks requires some combination of Thoughtseize/Duress, maybe even IoK. However, to use that disruption Turn 1 you have to both fight through Misstep and it slows down your explosiveness (the only way to get a Turn 2 TKS off a Turn 1 discard spell is exactly Urborg + Eye, or the few pieces of fast artifact mana available to you (Sol Ring/Crypt). In a way, Eldrazi is similar to Merfolk where they can drop a few threats early and get larger with more Lords in play. However, Merfolk get to play countermagic. That's a huge advantage. I really do feel that any Eldrazi deck is going to have to rely on black disruptive Enchanments Nether Void and Chains. The deck can also run Misstep, but I wonder how much life this deck can afford to take with Ancient Tomb such a large part of the mana base. I'm cautiously optimistic, but wouldn't be surprised if it's junk either. Ah man... unfortunately, I really missed the boat on getting the cards together on MTGO, so won't be able to try this myself for a while (though getting the paper stuff together at least). While I'm sure the deck would enjoy unrestricted Chalice as per the Modern version, perhaps playing 4x Thorn of Amethyst (plus the one Chalice & maybe 3sphere) is the way to go, to slow down the broken decks? That might be a bit easier on the manabase. As to lifeloss - a Tomb of the Spirit Dragon in the SB against decks pressuring your life total is just one idea. Worked well for UR Modern Eldrazi. I agree on the comparison to Merfolk and it will be fascinating to see if someone can knit this together into a workable whole. The Eldrazi deck could just pack Leyline of Sanctity and have immediate game against combo. Void/Chains are as slow as Seer. However, to use that disruption Turn 1 you have to both fight through Misstep and it slows down your explosiveness (the only way to get a Turn 2 TKS off a Turn 1 discard spell is exactly Urborg + Eye, or the few pieces of fast artifact mana available to you (Sol Ring/Crypt). And Moxes? The Channel Fireball deck ran Simian Spirit Guide, so some colored mana isn't prohibitive. Eldrazi Mimic into Phyrexian Dreadnaught isn't good enough but it's pretty adorable. I played this list at a 17 person FNM Vintage tournament in Marietta, GA last Friday. I was 4-0, 9-0 in games, but went 3-1 because I showed up to the tournament 15 minutes late, played the match, and beat the guy. I only played fair decks (i.e. blue decks), missed playing Workshops. It abused the fair lists. Cavern on Reality Smasher (the premium planeswalker destruction card in the format) or Though-Knot Seer is just too much. Sea Gate Wreckage drew 3 cards one game for me. Library of Alexandria is the ideal turn 1 play on the draw. This is extremely adorable. If we all really really want it to be good enough maybe we can make it happen. I believe in us. How were the Bearers? Also no Eye of Ugin seems wrong honestly. I'd also consider some number of Oblivion Sower, since you have main deck Leyline and Deathrite Shaman to exile more lands to get extra value out of Sower. I debated playing an eye. For the record I have all the eldrazi cards sitting around, some are better suited for modern and legacy than they are vintage. I think eldrazi mimic and oblivion sower are two prime examples of it. Eye of ugin as a 1 of is probably correct, but it oddly doesn't tap for colorless mana just reduces genetic costs. Eye of ugin shines when you cast multiple eldrazi on the same turn, so having low curve cards like eldrazi mimic and matter reshaper make eye better. I'm not playing any of those cards. My low end curve is deathrite shaman instead of mimic, effectively. Which turns on blight herder and wasteland strangler. Both of those cards are better in vintage than they are in modern, while deathrite shaman is one of the best 1drop creatures of all time. Bearer of silence is a great card, again better in vintage/legacy than it is in modern. It's ability triggers on cast, so the only way to counter it is with a stifle effect. The main reasons for not running eye of ugin were the 3 main deck null rods that can't be cast off mana from it. And potential sideboard cards like nether void. O sower is worth considering, but it's probably just too slow. I like the card a lot, don't get me wrong. Without a doubt, this deck would have greatly benefited from 4x Chalice. Too bad we can't restrict combinations of cards (e.g. Can't have 4x Workshops and more than 1x Chalice in the same deck). I agree, Chains and Nether Void are slow, but they would provide the durable support after a Turn 1 discard spell, in theory at least. Have to test it out. Leyline of Sanctity solves the Storm problem, but not a fast Vault/Key. There isn't really a storm problem. You have 3 null rod, 4 leyline of the void, 4 deathrite shaman, and 4 thought knot seers mAin deck. Plus demonic tutor and vampiric tutor. If they tinker for blightsteel colossus, you have bearer of silence. In the board you get chains and nether void that both read game over. Plus a 4th null rod, mental misstep and grafdigger's cage. You also play things like bearer of silence as a pressure threat 2 drop and not a 4 drop. You named 11 cards that would come in. What do you take out against storm?